I find that a pale color like this lightweight trench from H&M is an iffy color for me. If the color was coming from a t-shirt or a skirt, it would look hideous on me. I know because I've tried it before. Ew. But, in the form of a trench I am quite fond of the color. This may have more to do with the way the trench flows and how easy it is to wear as an "effortless" outer layer. It gives an instant "cool" appeal that I don't innately have. Yup, I'll be wearing this trench over and over this season. 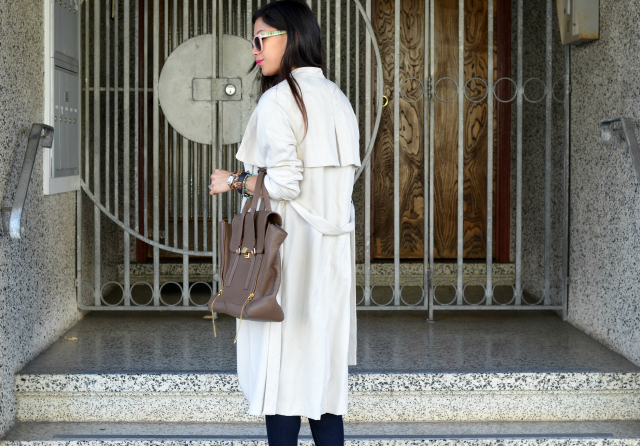 LOVE this long trench on you! Love this outfit! Obsessed with those shoes! zomggg love this look! online shopping at h&m now! This is a super chic outfit! Loving the trench, and those heels are gorgeous! love the trench! i have one but i realized that i bought it at a time when i was so into 3/4 sleeves. i'm not too fond of them anymore. i never thought to maybe roll up the sleeves a bit to give it a different kind of look. i should try! Hey lady, looking good as usual :) Love your trench coat. I know what you mean about certain colors not looking that great next to your skin. Mine is yellow. Looks horrible on me! That trench is fantastic. I love the shape. Such a chic trench, and the color looks amazing on you (I don't know what you're talking about!!). Ahh I would wear that coat all the time. Lovely. xo! Very nice! I do like your trench! You look great! Whenever I see those shoes I'm always bummed I missed out on them. I hope to find them whilst thrifting one day! Love the trench coat, nice look! You look so stylish and I love the trench and skinny jeans!! The heels are perfect too with the whole look. The trench looks amazing on you! This trench is very pretty! 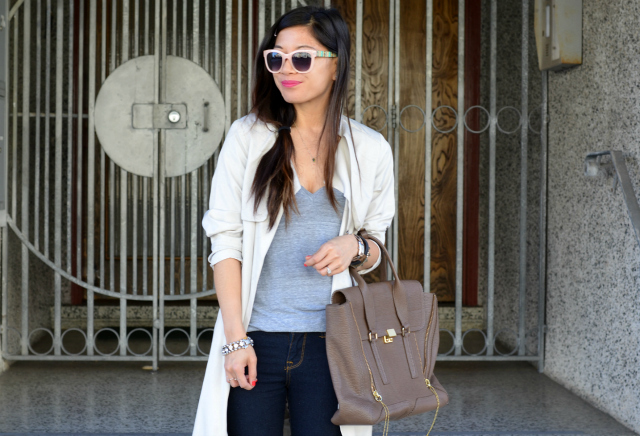 a trench is the perfect spring jacket! Girl you are insanely cool and chic in everything you wear! And this outfit is no exception. Gorgeous! so chic from head to toe! you look fantastic Nancy and the trench looks amazing on you and the color is versatile. Thank you for visiting my blog again. Love the length and it's really pretty. I love this lightweight trench- I think it was a fantastic purchase! your outfit is very stylish! Love those sunnies and those jeans are perfect! I love the jacket! Really great look!